The New Orleans Regional Transit Authority (RTA) gave us all a nice holiday present on Tuesday, December 19 when they approved the long-term strategic transit plan. The plan is a big step forward and sets the table for major transit improvements in the coming years. Ride New Orleans played a big role with this plan. We kept the public informed and pushed for real reform throughout the process. But the hard work is just starting and we need your help. 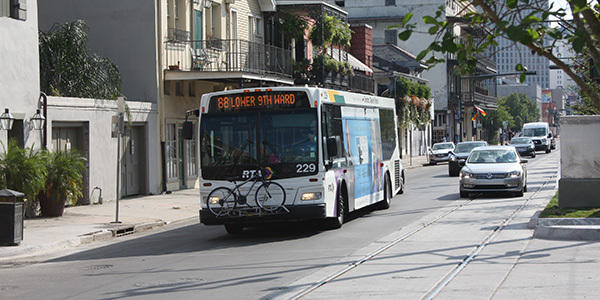 Will you support our campaign to make this plan a reality for New Orleans transit riders? Please consider a donation to our year-end campaign before 11:59 p.m. on December 31! Keep reading below for an overview of why we like this plan and what the next steps are. In recent years, it’s been hard for RTA riders to push for change because there was no well-known plan, set of goals, or framework to guide transit improvements. There was no easy way for riders to comprehensively hold the RTA accountable. This plan changes that with a detailed series of action items that are well-organized by strategies and goals, and tied to clear performance measures and targets. Transit riders now have a checklist of what needs to happen and a timeline of when it needs to happen. While that won’t turn around transit overnight, it will make it a lot easier to hold the RTA accountable in the coming years. And that’s a really important win! The plan redefines success for the RTA with a number of important metrics. Especially exciting is a goal to double the amount of jobs accessible via transit over the next 10 years. That’s an important goal that Ride New Orleans has often stressed. This should prioritize projects that get riders to their destinations more quickly instead of projects like the Rampart-St. Claude streetcar expansion that don’t increase access to jobs and other important destinations. When we spoke in favor of the plan this week, we reminded the RTA board that passing the plan is the easy part. Finding the will to stick to the plan and make a real push to find the funding to implement the biggest parts of the plan are harder. Especially important is a 2018 launch of a comprehensive operating analysis (COA). This is a detailed study of rider demand and travel patterns and that precedes a network redesign. Those are both really important pieces to ultimately give riders increased frequency, reliability, and connectivity. A smart network redesign can improve both without the need for immediate new funding. The strategic transit plan calls for these processes to be completed at some point in the next five years, but riders need to see them started within the next year. We also need to quickly begin studies of the proposed high frequency transit corridors ASAP to determine what investments need to be made and how much they will cost. 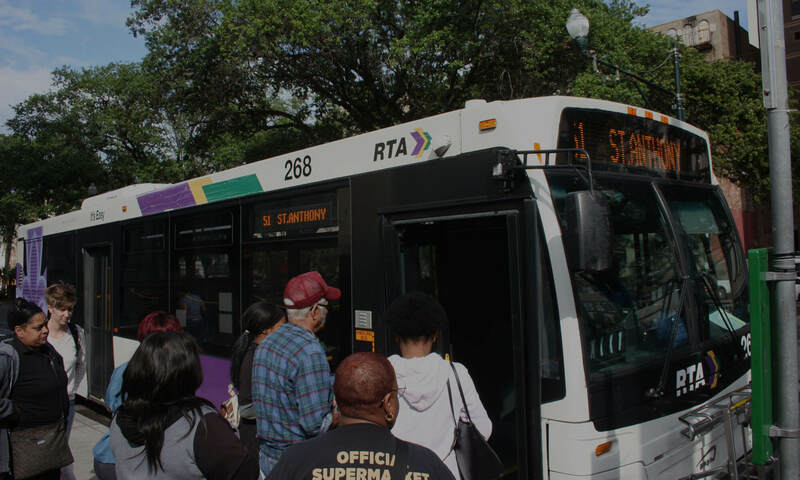 Additionally, RTA officials must start conversations with Jefferson Parish and other parishes to determine the best way to implement the regional routes that the plan calls for. Finally, riders need to see short-term improvements to service as soon as possible, even if the true high frequency lines are a number of years in the future. Small increases in frequency on high priority lines throughout the day and on nights and weekends would be a great step. You can review the completed plan’s summary table for yourself here. And you can check out press coverage in the Advocate and the Times-Picayune. We appreciate your ongoing support of better transit in New Orleans and wish you and your family the best for the holiday season! We’ll be back in touch in early 2018 with an update on what’s happening and how you can get involved. In the meantime, please consider a year-end donation to help us start 2018 strong. Your support is an important part of our annual budget and we greatly appreciate your continued trust in our work! Next PostNext Check out the Ride New Orleans video!